Don’t forget to check out my online course HTML5 Mobile Game Development for Beginners. Get 90% OFF!. Only until the end of the month. Over the last few years, HTML5 has come out as a great alternative to develop cross-platform app using a single code base. A HTML5 app can run on iOS, Android, Windows Mobile, Blackberry.. and of course good old Desktop. In this tutorial you’ll learn the basics on how to create a simple farming game that emulates those big hits you’ve played on Facebook. We’ll be using an open source HTML5 game dev framework called LimeJS. Farming games are a big phenomena that knows no limits when it comes to nationalities and generations. Fortunes have been made around them and people have created variations from the original concept. It’s not strange to find medieval, tropical, futuristic, even zombie themed farming games in the various app stores out there. What is the reason behind this success? do we miss plowing the land with out bare hands in this post-modern urban civilisation? is this related to the urban farms people now grow on their balconies? Well who knows! ..
I’m not gonna tell you what the reasons are for their success (not that I know them anyway) but I am, on the other hand, gonna teach you how to make a simple farming game using HTML5 and an open source JS framework called LimeJS. You can dowload LimeJS from their home page. Installation instructions and a good intro can be found in the Getting Started Guide. If you want step by step, video-based instructions on how to install this framework in Mac, Windows or Ubuntu and get a good hold of the basics feel free to check my online course, which teaches you all the basics of game development using LimeJS and other free tools. If you want more info about my courses ask me on the comments section or on Twitter (@ZenvaTweets). That is just a basic boilerplate (if you open farming.html you should see a black screen). Firstly, we are providing the namespace “farming” which is required to do when working in LimeJS. We are then including relevant framework modules. Our farming.start() is the first thing that is run when the game loads (see how this is being called in farming.html). We can define an object called gameObj (or however you want) to store some game-level variables. We will be passing this object around to our game elements so that these properties can be accessed from everywhere. In the next blocks we are defininig our “director” object which does a similar role as real life directiors: define which scenes are playing, etc. Our game will have two layers (which are areas where content will be placed). landLayer will host the land and the crops. controlsLayer will have the status area and the options for the user, which in this case is the button to enter the shop. The tiles used in this game have been adapted from Daneeklu’s artwork which has been released under the CC-BY-SA license, allowing us to use it for this purpose. You can download all the game files from this link. What we are doing here is creating a new type of object as per the LimeJS specs. This object “inherits” from the lime.Sprite object, so it behaves like a sprite in all ways. See how we are providing the namespace like we did before. We are passing the game and the player objects in the constructor, and we are setting up some basic properties so that we don’t have to enter them each time we create a farming.Land object. The first thing you do in a farming game is to plow the land so that it’s ready to receive the seeds. After you plant the seeds, they grow until ripe. We have then a total of 4 possible states for a lot of land (empty, plowed, growing and ripe). Let’s represent that by adding these states in our land.js file right after the “goog.inherits” part. What this does is attach the events “mousedown” and “touchstart” to the statements inside the listener. See how easily LimeJS allows us to create something that works in both touch and non-touch devices from day one. Ok plowing land can be fun, but to really make it as a farmer you need to buy seeds and grow your stuff. 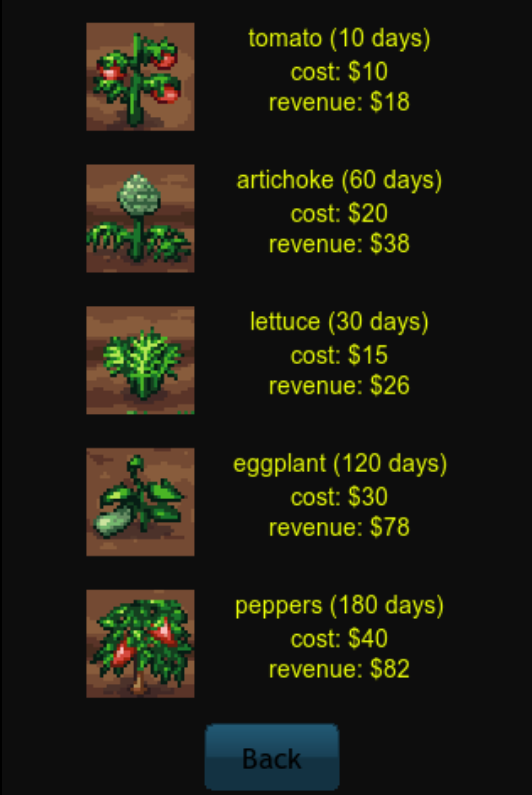 Lets start by putting all the crops in our game object. Add the following in farming.js after the player object definition. See how you can easily change the parameters and tweak it however you want. Each type of crop has then a name, a cost, a revenue that brings in when harvested, the time it takes it to be ready (in seconds), the time it takes it to die after it is ripe (in second), and an image file. This creates a new scene for the shop, links our “Shop” button to the opening of this new scene. It also adds a “Close” button to the shop. You should now be able to open and close and empty shop. 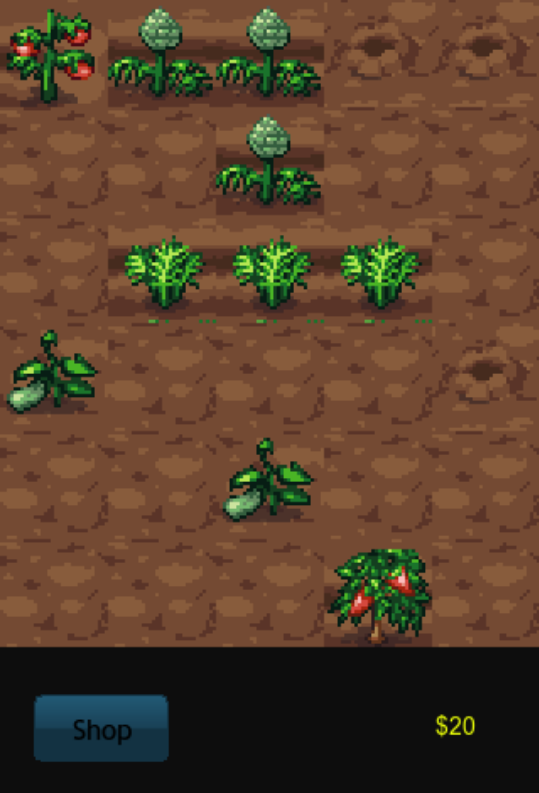 The following code (which goes right after what we just added) will display the crops in our shop, and allow the player to pick one (that will be stored as a property of the player). We are checking that the land has been plowed and the player has enough cash. If so, we are planting our seeds, changing the state of the land element, storing the relevant times (in milliseconds) and updating the money. You can start plating now! Each crop has their own time to maturity and time to death. We want to check that and replace the images and states of the land elements when these times are reached. When the crop is ready for harvest, we want it’s image to be that of the crop. When a crop dies, the land is set back to empty. LimeJS comes with a scheduler helper that allows us to check for events every X number of milliseconds. The following code will take care of the growth and death of the plants, add it after the event listener in land.js. You are now able to plant.. but you can’t harvest yet. You can download the complete game from the this link. I hope you’ve enjoyed making this simple farming game. Things that can be added to expand it further are progress saving, for which you can use something as simple as local storage, and of course social integration, so that you can share your farm on Facebook or Twitter. I would like to encourage you to keep on learning HTML5 game development and to check out my game dev courses, which are designed for beginners and will save you hours of learning on your own.